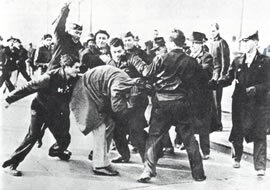 A scab is attacked by Ford strikers in April 1941. Photo from the Detroit News. Photo by Milton Brooks. During a strike the company loses money every day that striking workers are able to shut down production. Often companies try to bring in new workers to take the place of striking workers. These new workers must cross lines of picketing strikers to enter the workplace. This usually upsets the strikers very much. Striking workers call these new workers "scabs" and other derogatory names and try to prevent them from entering the workplace. Strikes are only effective as long as the workers stay united in their struggle against management. Strikers receive no pay during a strike, but the union usually has a strike fund from which they pay workers a small amount so they and their families can survive. Other unions often contribute to the strike fund, knowing they will get help if they go on strike in the future.